Find artworks, auction results, sale prices and pictures of Louis Leveque at auctions worldwide. 'Slave Girls'; a bronze figure group of twoslave girls, signed Leveque, dark brown, black and polished patina,48.5cm., high. Provenance: originally from the Ken Paul Collection.Offered for sale by Sotheby's in 2002. 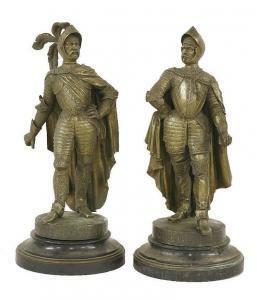 This bronze was hired as aprop for the filming of 'Quills'. 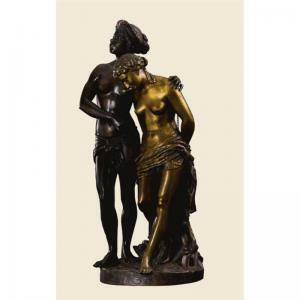 This is one of Edmond Leveque'smost successful bronzes, reflecting the 19th century passion forexotic Orientalist subjects. 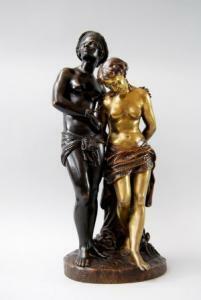 'Slave Girls'; a bronze figure group of two slave girls, signed Leveque, dark brown, black and polished patina, 48.5cm., high. Provenance: originally from the Ken Paul Collection. Offered for sale by Sotheby's in 2002. This bronze was hired as a prop for the filming of 'Quills'. This is one of Edmond Leveque's most successful bronzes, reflecting the 19th century passion for exotic Orientalist subjects.